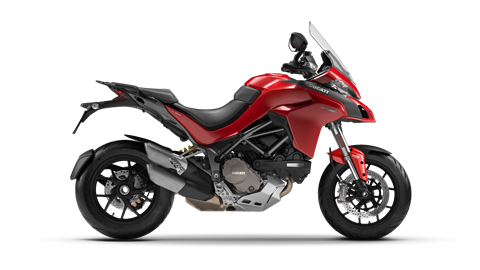 FRAME: The Multistrada 1260 chassis is based on the use of a frame and a longer swingarm. The steering angle has been increased by 1 degree, from 24° to 25° while the swingarm, is 48 mm longer. These changes have led to a total increase of the wheelbase of 2.17 in. (55 mm). This, coupled with the character of the engine and the suspension calibration, mean that the Multistrada 1260 is even more effective when tackling curves whilst ensuring maximum stability even at full load, with side panniers and pillion rider onboard. The ""layout"" adopted for the frame consists of a front trellis with large diameter thinner tubes, two side subframes enclosed by a rear support element made of fiber loaded engineering plastic for maximum torsional rigidity. The single-arm swingarm is obtained from a single die-cast, with four cores bonded together on the inside, subsequently machined and painted. The result is a magnificently sculpted, beautiful and functional component, bestowing ulterior prestige to the Multistrada 1260 and guaranteeing excellent road grip. DISPLACEMENT AND TORQUE: Thanks to its displacement of 1262 cc, the Multistrada 1260 engine sets outstanding riding and performance standards. 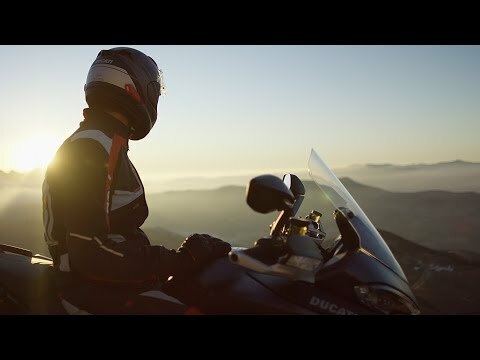 In developing this engine, derived from the unit fitted on the Multistrada 1200, Ducati engineers focused on guaranteeing the maximum and best possible torque delivery at low and mid range engine speeds. 85% of the torque is in fact already available below 3,500 rpm with an 18% increase in the curve at 5,500 rpm compared to the previous model. All this makes the Multistrada 1260 the motorcycle with the highest torque value in its category, an exceptional 4,000 rpm, i.e. the average rpm rate used when riding. To reach this displacement level, the piston stroke was increased to 2.81 in. (the bore remains 4.17 in.). This was achieved thanks to the use of connecting rods, a crankshaft and cylinders. The DVT system was then recalibrated to maximize mid to low range engine torque delivery, leading to a maximum power of 158 hp at 9,750 rpm and a maximum torque of 95.5 ft. lb. at 7,500 rpm. EXHAUST SYSTEM: In order to achieve the extraordinary performance of the Multistrada 1260, the exhaust and intake systems were also redesigned. The exhaust has a pipe design, interrnal layout of the pre-damper and a silencer, while the air intake inlet area has also been redesigned. TFT INSTRUMENT PANEL: The Multistrada 1260 is equipped with a high visibility LCD instrument panel with a information display and simplified menu management. Front - 5-spoke Y-shape light alloy; 3.50 x 17 in.